During spring commencement, the University of Michigan will forego its traditional honorary degrees to recognize ten young alumni with a special Bicentennial Alumni Award. 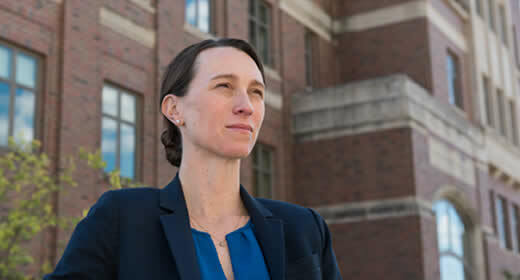 Among the bicentennial honorees is Ford School alumna Annie Maxwell (AB ’00, MPP ’02), who is president of the Skoll Global Threats Fund, a nonprofit organization that combats "wicked" problems through targeted interventions. “The [bicentennial] alumni awards give us a very special opportunity to recognize individuals from our more recent past who can inspire our community through their outstanding ongoing work,” says U-M President Mark Schlissel. Prior to joining Skoll, Annie Maxwell served as chief operating officer of Direct Relief, a nonprofit that sends medical supplies to clinics operating in areas affected by poverty and disasters. In 2005, she was tapped to assist the Office of the United Nations' Special Envoy for Tsunami Recovery and in 2009 served as a White House Fellow, a highly prestigious fellowship offered to candidates with exceptional, early-career achievements. Jennifer Niggemeier, director of graduate career services and alumni relations, recognizes Maxwell not just for her professional accomplishments, but for her longstanding support for the next generation of policy leaders. “She’s been a mentor to so many Ford School students over the years...from developing internships to modeling the way for women in leadership,” Niggemeier says. Susan M. Collins, the Joan and Sanford Weill Dean of Public Policy, agrees, stressing Maxwell's deep-seated values. “Annie has spoken extensively about her belief that solving the world's most vital challenges requires our full collective intelligence and creativity, which we can only catalyze by engaging diverse people and perspectives throughout the process," says Collins.